It’s been a year of quite a many new faces. While it’s no surprise that Bollywood has always been a dream for many aspiring artists, few actually see their dream come true. And for some, Bollywood just comes to happen by chance. Like they say, it’s all destiny. Which is why a musician by choice and a sound engineer by profession, Harsh Parekh, never thought that he would see himself in front of the camera, onscreen. Here the debutant from Shakal Pe Mat Ja talks exclusively to BollySpice about music, acting and Bollywood. What was your state of mind just before the release of your movie? Well, there was nervousness, excitement – feeling of excitement overpowered everything else. After the initial shows I got calls from my cousins and friends all over who told me that the theatres are packed and that there’s a lot of crowd and people are laughing and enjoying the film. So tell us a little bit about Shakal Pe Mat Ja and your character in the movie. 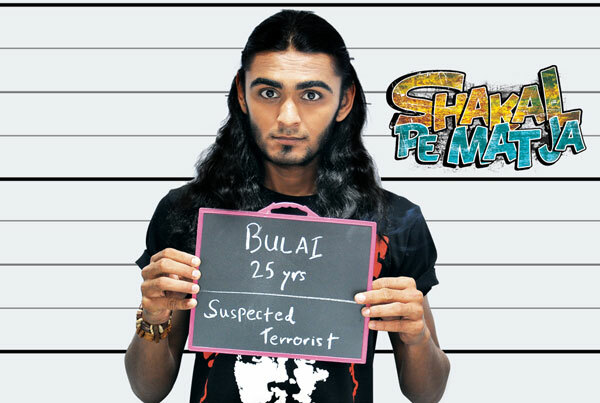 Shakal Pe Mat Ja is basically about four young guys who want to do something in life. They are so determined mentally that they aren’t able to do anything or make their dreams come true at all. But then finally they come up with – according to them – a foolproof plan. And how executing that plan of shooting a film on terrorism itself leads to them being mistaken as suspects leading them deeper and deeper into the mess and how they come out of it. My character is Bulai; I am playing the role of a Bengali rockstar. Basically Bulai is a very anxious, nervous guy – very much the state I was in during the release of the movie – keeps biting his nails, comes up with ideas which are very vague and absurd and cannot be materialized. And he is the guy because of whom the others fall deeper and deeper into trouble. I had to study the character of Bulai before we shot the film. I had to literally get into the character and follow a few gestures like primarily biting his nails – if you see the movie you will see me biting my nails throughout the movie – and it so happens that I can’t get rid of the habit anymore. I am finding it difficult to let go of it! It so happened that I was shooting and was expecting a very important call that time. Luckily we had just got a five minute break when I got the call, so I took it and by mistake reached outside. And during that shot I was wearing a burkha. I was in such a hurry and the call was so important that I hardly realized that I am in a burkha but I just walked out on the street. I was so engrossed talking that I went to the main road and people got suspicious and called the police saying that there is a man roaming around in a burkha. And to my bad luck this had happened immediately after the blasts when there was high alert in the city. I was just about to return when I saw 30-40 people in a group standing at a distance thinking that I will press a button and blow myself and everybody else up! Before I could realize anything I was taken to the police station. I put the naqab up and told them that I am an actor. He didn’t believe me and asked for identification but as I was in a burkha I had nothing on me! I took them to the director and they finally let me go but it was then that I understood the seriousness of the situation. Was acting something that you had always wished to do or did it kind of just happen? Honestly, cinema had always fascinated me since childhood. My father used to sit next to me and we used to watch movies together on Star Movies. I started following Arnold Schwarzenegger, Bruce Lee, Jackie Chan right from the time I was in school. Whenever there used to be “obscene” scenes in the movie, my dad used to cover my eyes! So I loved cinema and wanted to see myself there – and I see that happening at this stage of my life. I am passionate about music….there are a couple of bands in India that I have played with. But my dad wanted me to explore more and encouraged me to do sound engineering. So I finished my audio engineering from The School of Audio Engineering which is an Australian Institute. After that I got into a film post-production firm called FutureWorks where I handled sound for films like Kaminey, Ishqiya, Rajneeti etc. So how did this transition from music to acting happen? During sound for Kaminey, Shubh Mukherjee (director of SPMJ) had seen me the first time- I had worked with him for his movie Nakshatra-and he kept me in mind. Least expected, he gave me a call two years after that and asked me if I still had long hair and I said, “Yes I do.” Then he asked me if I still look like a cool dude! So I replied that I don’t know about that but I do look the same! He then asked me if I will act in his film and I was totally surprised. Careerwise I was pretty much stable at that point – I was the HOD of the sound department of Vidhu Vinod Chopra Films – and hence was skeptical initially. But Shubh asked me to come down once and listen to the script of the movie. So when I heard the character of Bulai and the entire concept, I totally loved it and decided to be a part of it. What was it exactly about the script that made you say a yes to it? Shubh explained me the concept and I thought that films like Tere Bin Laden, Delhi Belly, Shakal Pe Mat Ja are made not everyday. You see a Dabangg, a Ra.One, a Bodyguard – big budgeted – movies coming out and you see them not doing well. Movies like Tere Bin…, Delhi Belly have created a fan following…a cult. So when I heard the concept I realized that it was one of those films…that genre which will hit the audience hard. And the character, the role too played a major role in finally convincing me that Shakal Pe…. is a good deal and I should go ahead with it. Shakal Pe… being your debut movie, how did you prepare for it? We used to have these rehearsals and workshops that our director kept. We used to gather together and rehearse scenes before the shot. Before starting the shoot, we used to understand pretty much by reading about it,…so ya, I did pretty much prepare before the shoot. As a newcomer did you face any challenges? Well, I did not have high expectations. What happens is when you have them and you don’t meet them then you are disappointed. So I kept in mind that I am a newcomer, the industry is big and there are way bigger people than I am…So I never lifted myself up from the ground. I still have roots in the same place where before the film I was…. You mentioned about the fate of small budgeted movies. Did you face any problems because of this for your movie? Well honestly, nothing that I can keep on my heart for a long time. Yes, there were a few minor issues which I believe happens with everyone, so those were well taken care of. In the bargain I have lost my few belongings during the making of the movie( laughs), but that’s fine, no hard feelings! How was your first experience as an actor? As I actor it was the first time I was in front of the camera and knowing that it will come up on the big 35mm screen..hundreds and thousands of people will be watching you, the feeling was different. Initial few days I was nervous, but once I got into the shoes of Bulai and I understood the character, shooting for the film wasn’t a big task after that. Once I got the hang of it, it was very easy and yes, very exciting! Shakal Pe Mat Ja released in India on 18th November. BollySpice wishes Harsh all the best for his future ventures.